Hi hi. Say hello to the easiest itty bitty holiday treat in the universe. I am fascinated by all things marshmallow. It makes me feel like a child. Like, even the WORD marshmallow. It just sounds fun and fluffy and like a wonderful sugar cloud that I want to bounce on and attempt back handsprings on and take a long winter’s nap on and take a big fat bite of a snack when I need one. I want to belt out “it’s a marshmallow world in the winter” at the top of my lungs and find the best acoustics in my house to do so. I want the snow to really be made of marshmallow just like I wished my walls were made of edible chocolate covered peanut butter. 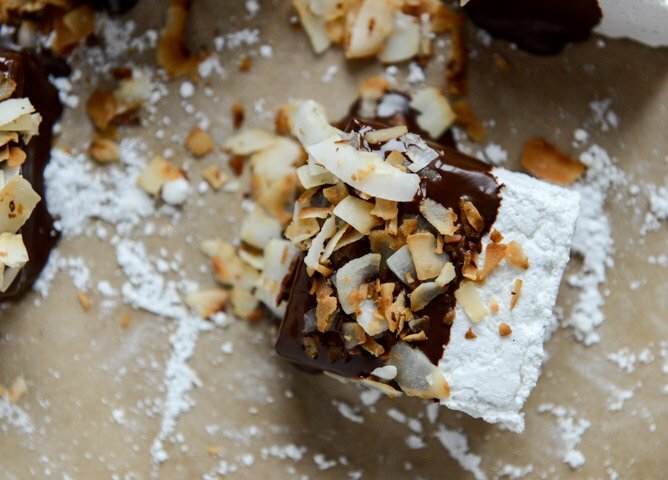 I want to make homemade marshmallow everything. I’m already a marketer’s dream but if any beauty product has “marshmallow” in the ingredients (um, I have no idea how but some do and I’m sure it’s for idiots like me) I immediately buy it. Marshmallow candles? I’m doomed. Regular bagged marshmallows don’t especially do it for me though. They never have. But! Homemade marshmallows? I can take down an entire pan by my lonesome. This is one of my go-to, no-fail recipes to make for birthdays, parties, treat bags or homemade gifts. 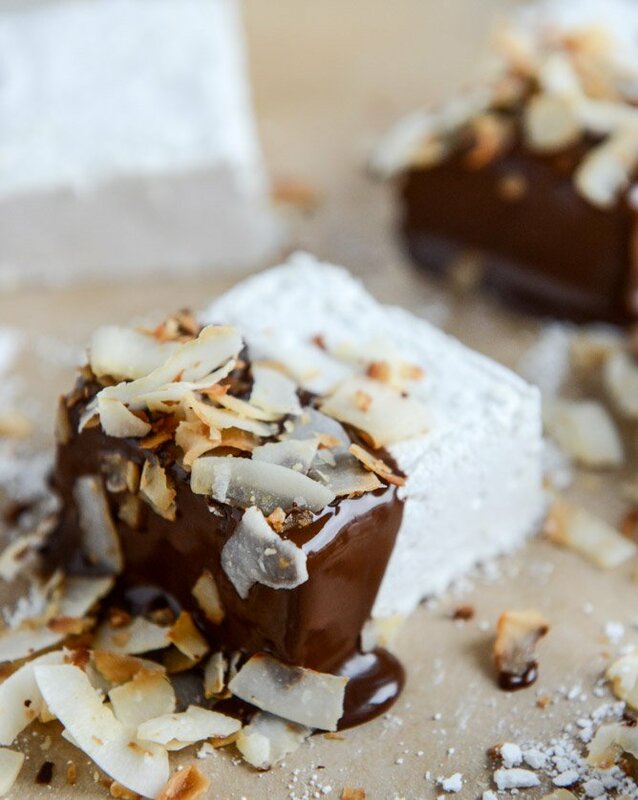 I mean, homemade marshmallows are one thing but coconut marshmallows… with chocolate… and more coconut! Real deal I tell you. I first made these for my mom over two mothers’ days ago (um, someone please check my apostrophes because I just spent 20 minutes and ten google lives trying to figure that one out, the internet has ruined me) when I deemed regular marshmallows “too boring” and wanted to spice it up a little. But not with actual spice. Just with more… trashy flavor. You know. You get it. They were the biggest hit EVER. My mom is the type of person that bakes a pan of brownies or an entire cake and can enjoy one sliver per day – nothing more, nothing less – she isn’t even tempted. She loves desserts and sweets but I’ve never seen her ask for a dessert or sweet like she does with this one. I pretended like it was my best kept secret here but really… I just thought it might be too boring to share. But then. I made them last year for holiday gifts and our cookie tray, and I knew I had to share. 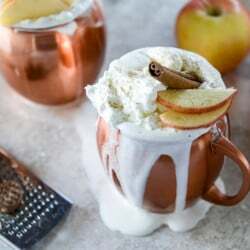 They are extra special around the holidays because they can serve multiple purposes (HELLO HOT CHOCOLATE) but they truly work any time of year. Especially these flavors! To say that I’m a coconut chocolate freak would be a severe understatement, but I think you guys already know that. Can you just imagine THESE marshmallows in THIS hot chocolate. ??????? Place the gelatin in a small bowl and stir in the 8 tablespoons of cold water. Set aside. Spray an 8×8 pan with nonstick spray, then sprinkle some powdered sugar in the pan and shake well, dispersing it all over the pan, covering the entire thing. In a small saucepan, combine the remaining cold water and sugar. Heat over medium heat, stirring constantly until the sugar is dissolved and bubbly, about 3-4 minutes. Stir in the gelatin mixture, whisking, and bring it to a boil. Once boiling, immediately remove from heat. Add to the bowl of an electric mixer attached with a whisk. Let sit and slightly cool. Add in coconut extract, vanilla bean paste and salt. Beat on medium-high speed for 10-15 minutes, until white and glossy and shiny and thick. Spread in the 8×8 pan and top with a sprinkle of powdered sugar if desired. Let sit for about 4 hours, or even overnight. Stir the coconut oil into the melted chocolate. Once the marshmallows are set, dip half of each in the melted chocolate. Or heck, dip them the whole way if you want! Right after dipping, sprinkle the toasted coconut on top. Let them sit for 30 minutes or so before serving. What can I use instead of the vanilla bean paste? Just made these this morning. I thought I burnt them because I let it boil for a second too long and it started to brown but when I put it in the mixer, after 10 minutes, it was white, glossy and thick. They are sitting in the pan right now. Fingers crossed it will work out. Can you use a hand mixer instead of a standing one? I’ve been trying to look all over the internet for an answer but maybe it’s to dumb of a question I don’t know all I know is I can’t find a straight answer all I seem to find is how they’re different. Also do you have to use coconut extract or can you use something (Also coconut related) a bit more organic? you can try a hand mixer, but the speed may not get high enough to really whip the marshmallow – especially because you whip it for so long (and can’t really take a break!). you could always try to half the batch, in the case that it doesn’t work, you don’t waste as many ingredients. there are organic extracts that you can use (https://www.amazon.com/Flavorganics-Organic-Coconut-Extract-fl/dp/B00D8XD85U?th=1), but you can’t really use anything else to flavor these, because you’d need a large amount. does that make sense? the extract works because you need such a small amount that it doesn’t interfere with the marshmallow base!